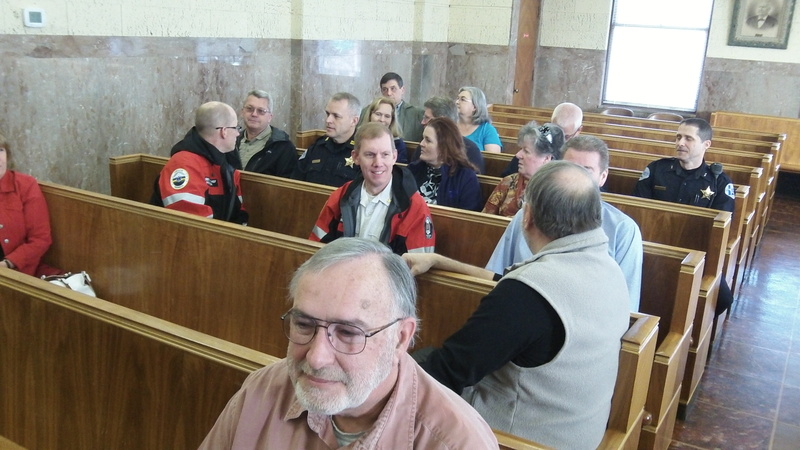 In the courtroom March 5, before ballot challenges were argued. So why exactly is the forthcoming Albany bond-issue ballot measure written in the form of a city charter amendment rather than simply as a question on the bond borrowing itself? I think I know the answer, and it comes from the wording of the charter section on debt the voters approved in 2013. You remember that fiasco? Voters approved Tom Cordier’s initiative to require voter approval of most new city borrowing. There was a lot of gnashing of teeth over exactly what that meant. In addition, acting on legal advice, the council decided that the measure was not adopted by the required majority of all voters. So the initiative’s sponsor and the city worked out replacement language that accomplished the same goal without the complications, and in September 2013 the voters again approved. Apart from the needless capitalization, this wording is clear. Unless Section 44 specifically allows it, the council can’t authorize any borrowing. Section 44 mentions nothing about a police headquarters or fire station. So even if Albany voters approve a bond issue for that purpose, the city council can’t go ahead because Section 44 does not “specifically” allow it. And that is why the proposed $18 million bond issue for the police and fire projects is being proposed as an amendment to the charter, a new subsection of Section 44. If it passes on May 19, that section will say, specifically, “The city is authorized to issue up to $18 million … of general obligation bonds” … for police and fire capital projects. On Friday afternoon, Circuit Judge Dan Murphy disposed of two challenges to the ballot title for the May 19 election. He dismissed a petition by Gordon Shadle on the grounds it was filed one day past the Feb. 23 deadline. This deadline was valid despite a couple of city mistakes in posting it because, the judge agreed with the city attorney, there’s case law saying that statutory deadlines can’t be changed by what officials say or do. Murphy agreed with petitioners’ arguments in court that the caption of the ballot title should say the measure would amend the city charter, and he added wording to that effect. You have a novel interpretation, but can a local law restrict or limit what state law already allows? ORS 287A is pretty clear that all that is needed for GO bonds is voter approval. There is no mention of local governments having the authority to restrict this approval to a charter amendment. If the city uses your interpretation, would they be opening themselves up to a legal challenge? Wouldn’t that be fun? I agree. It’s time to move on and let the voters decide this….again. Hopefully the city has re-read the campaign manual and will be more careful this time around. Cordier and Shadle have again wasted more of the people’s time and money trying to run government on their own, without getting elected to anything. The needs of both the police and fire departments have been clear for over 10 years to anyone who was willing to invest the time to read the information or take a look themselves at the facilities. I wouldn’t expect anything less from a city minion. When an Albany resident lawfully challenges city behavior, the city and their minions become hostile and angry. When an Albany resident lawfully makes the city change its behavior, the city and its minions go into a defensive crouch and lash out with personal attacks. It’s called arrogance. And here in Albany city officials and their minions demonstrate this attitude in abundance. Do you even live in Albany? Thank you Hasso for your answer to the why charter question that no one City official was willing or able to answer. You have helped me greatly with your research. What Mr. Woods has never understood is that those who are elected do not have unlimited power to do whatever they want in any way they want. The Oregon constitution makes it clear the ultimate power still rests with the people–and we don’t have to get elected to challenge the decisions made by those who are elected. Since Mr. Woods is a former city employee I would not expect him to ever understand that principle. Gee, I’m sorry you guys are so sensitive since Judge Murphy told you to go away. I’m sure it hurts being told that all your accusations and interpretations of the law are wrong. You see, we all agree that everyone has a right to go to court to try and redress their grievances. What we disagree on is the wisdom of going to court when you are so clearly wrong. As to the fact that I spent almost 14 years working for the City or Albany, well if that offends you … tough.